We close our 45th anniversary celebrations of 1973 today with a look back at New Year’s Eve, 1973. Today’s pictures (by Michael Putland), were taken at an RCA Records luncheon at the prestigious Rules restaurant in London’s Covent Garden, to mark Bowie’s extraordinary performance on the UK album charts. Unbelievable but a fact - David Bowie takes five places in the Top Fifty album charts for ten whole weeks - a musical achievement unique in our time. And now, the man who made Space Oddity, The Man Who Sold The World, Hunky Dory, Ziggy Stardust And The Spiders From Mars and Aladdin Sane is putting a new album into orbit. It’s called PIN-UPS and will be released in mid-October. That week, the man who released his debut RCA album just two years previously, had six albums in the Top Fifty. As far as we are aware, that’s a feat that hasn't been equalled by a living artist since. At one point, Bowie also had five albums in the Top Fifty for nineteen consecutive weeks. They don’t make 'em like that anymore. Here’s to the brilliance of David Bowie and an exciting 2019. FOOTNOTE: Rules was also the venue for the festive photoshoot that put David on the cover of the December 1969 edition of Fabulous 208. As we move to the close of our 45th anniversary celebrations of one of Bowie’s most successful years, 1973, here’s how Christmas in Bowie World was marked back then. The UK album chart was dominated by Bowie during the last quarter of 1973, as were the end of year music press polls. The image on the left was a record store flyer marking the success of RCA’s Bowie campaign since the release of Hunky Dory two years previously. It featured Terry O’Neill’s iconic shot of Bowie taken at The Marquee for the 1980 Floor Show in October. The Bowie billboard picture was actually a real thing proudly looking out across London, with the message: “It looks like Christmas love on ya! Bowie”. A version of it was used in a Record Mirror advert at the time too. A 1973 Christmas card sent to fan club members is reproduced on the right, with the message inside shown below. So whether you celebrate it or not during the holiday season, have a cool yule either way. Duncan Jones (previously Zowie Bowie), has tweeted a wonderfully poignant message, quickly followed by a typically humorous one. Got a bit emotional while wrapping tonight. Didn’t occur to me till tonight that when i named my daughter Zowie i would eventually be writing “To Zowie, from Dad,” exactly like my dad did for me when i was little. Ghosts of Christmas past. The 'this' to be used as a weapon during some future attack remains unidentified. Duncan is pictured here as new-born Zowie, with Dad David in 1971. Thank you for a great year on Spotify folks. 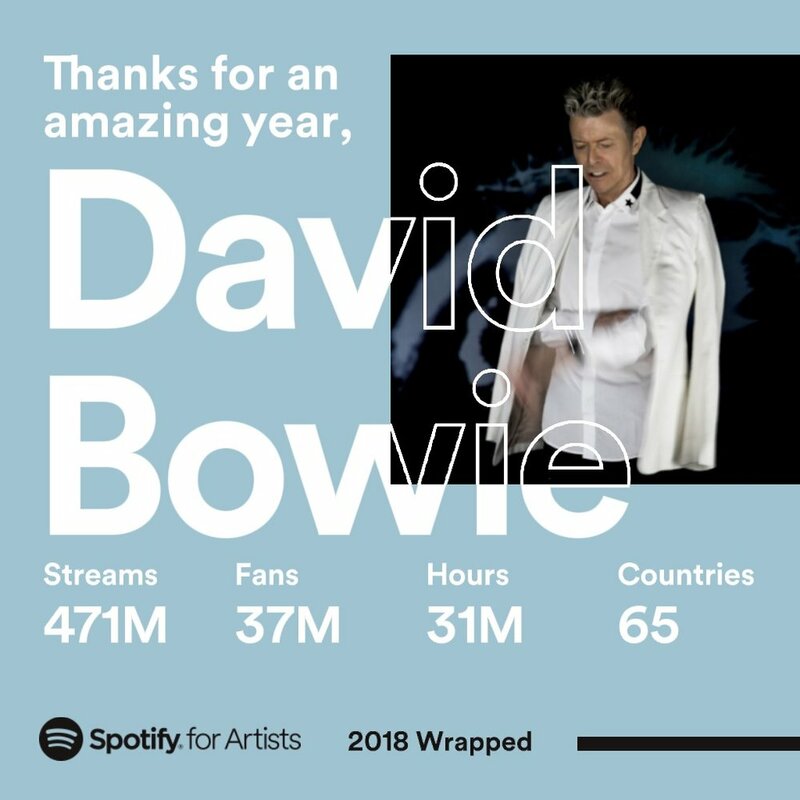 It’s apparent that the streaming app is becoming more and more popular each year for Bowie fans with an increase of 57% of followers in 2018. If all 37,493,480 Bowie fans on Spotify crammed together for a listening party, they’d need a room big enough to accommodate the population of Poland. Not a lot of people know that. If you’re not already using Spotify, check it out here. David Bowie’s Serious Moonlight World Tour climaxed with a performance of John Lennon’s Imagine, 35 years ago tonight in Hong Kong on December 8th, 1983. FOOTNOTE: The winners of the Ricochet contest have been contacted and have accepted their prizes. Worth a mention in case it passed you by is Bowie TV: Episode 10. In it, Mark Cooper, the BBC’s head of Music TV, talks about how he had to cut the live broadcast of David Bowie's headline slot at Glastonbury short after just three songs...much to the dismay of the viewing public watching at home. Thankfully he had the good sense to carry on recording regardless of what the BBC were allowed to broadcast, a decision he should be applauded for as we wouldn’t all be able to watch the full set now if he hadn’t. Read the full review and watch a great little video of a few Bowie fans being interviewed at the Glastonbury 2000 screening in London last week. Dr Ian Chapman over on ilikeyouroldstuff.com has written a piece titled: 5 STELLAR MOMENTS FROM THE GREATEST GLASTONBURY HEADLINER OF ALL TIME. Following our initial announcement of this last year and various franchise versions of Lazarus (including the current Hamburg run and the recently announced Oslo version), Ivo van Hove’s production of David Bowie and Enda Walsh’s Lazarus musical will première on October 13th at DeLaMar Theater in Amsterdam. Gijs Naber will play the lead part of Thomas Jerome Newton and the 50,000 available tickets go on sale today at 12.00 P.M. (CET) via Eventim. 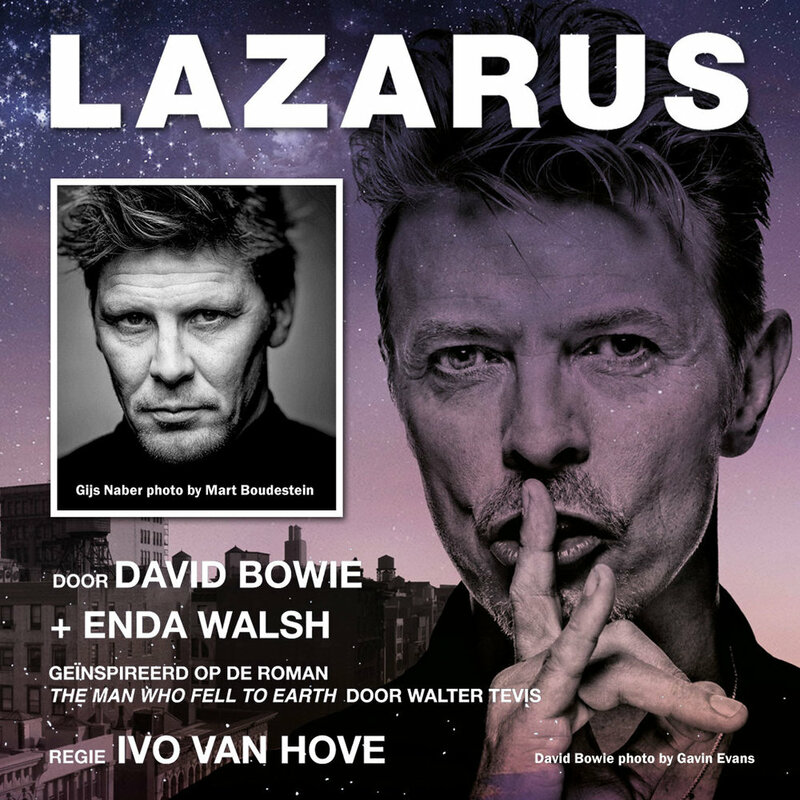 Gijs Naber will play the leading part in Lazarus, the David Bowie musical. Naber plays the role of Thomas Newton. Ivo van Hove, who created the show together with Bowie and Enda Walsh in New York, will also direct the Dutch production. Albert Verlinde, CEO and producer of Stage Entertainment Netherlands: "We are very much looking forward to Lazarus. I have been talking to Ivo van Hove for a couple of years now. Following sold out runs in both New York and London, I’m thrilled that we can now bring the show to Amsterdam. Lazarus is a very special show, one of Bowie's last projects and a musical work of art. It is fantastic news that Ivo van Hove, who created the original show together with Bowie, will also direct the Dutch production. The musical is an unforgettable theatre trip paying tribute to Bowie's genius mind. As the lead part is very demanding, I am extremely proud that Gijs Naber wlll join us in this adventure. He is our dreamed Thomas Newton." Legendary pop star David Bowie died on January 10th 2016. The musical Lazarus was one of his very last projects. Lazarus is a sequel to the book The Man Who Fell to Earth by Walter Tevis. Bowie himself played the role of Thomas Newton in the film adaptation from 1976, directed by Nicolas Roeg. Thomas Newton also plays a central role in the musical Lazarus, which is a journey featuring legendary Bowie hits such as 'Heroes', 'Absolute Beginners', 'Changes', 'All the Young Dudes', 'This is not America' and of course the title song 'Lazarus', especially written for the musical and later released on Bowie's last album Blackstar. The Dutch production of Lazarus is produced by Stage Entertainment The Netherlands by arrangement with Robert Fox and Jones/Tintoretto Entertainment and The New York Theatre Workshop. Actor Gijs Naber graduated in 2003 from the Toneelacademie in Maastricht. He played various parts in films such as The Heineken Abduction, Loft, Het Verlangen and Redbad. In 2014, he received a Golden Calf Award for Best Actor for his role in the film Aanmodderfakker. In theatre, he played roles in Woef Side Story and Lang en Gelukkig. For this last part, he received in 2014 a Musical Award for Best Supporting Actor in the category small musical. For his role in the play Death of a Salesman, he won an Arlecchino award. Gijs also played leading roles in television series such as Penoza and Zwarte Tulp.